One of the fastest growing cities in the nation, San Antonio is home to many hardworking Americans. It is also a popular tourist destination with the Alamo and River Walk. Take a stroll through downtown or enjoy dinner at one of the restaurants along the River Walk and you'll likely see stamped concrete. In recent years, stamped concrete has become a popular paving choice for commercial and residential projects alike in San Antonio and throughout Texas. Here is a list of concrete contractors in San Antonio . If you're a recent transplant to San Antonio and are looking for an affordable way to add outdoor living space to your home, we suggest looking into stamped concrete. Stamped concrete can be used to mimic a variety of materials such as stone, brick, pavers, wood and more. Pictured at left is a patio stamped with a random stone pattern designed to look like irregular flagstone. Many people in San Antonio like this rustic look because it suits the southwestern flavor of the city. 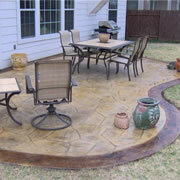 Adding a border to the patio in an accenting color and pattern is also popular amongst San Antonio homeowners. If you have a pool deck that has seen better days, whether it's been faded by the warm Texas sun, or it's just become outdated, it can be revitalized with a stamped overlay. 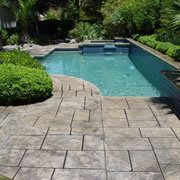 Stampable overlays make it possible to get gorgeous concrete without having to rip out your current pool deck and pour new concrete. Instead, your contractor will add a cement-based topping over your existing concrete and color and stamp it with the pattern of your choice. When it comes to value for your dollar, stamped concrete is a great investment. Starting at around $8 per square foot, you'll get something much nicer than gravel or asphalt, but save money in comparison to natural stone or pavers. Plus, if installed by an experienced contractor, stamped concrete will last for many years with minimal maintenance. You'll love the way your new driveway or patio looks and you'll have a little cash left over to take the kids to SeaWorld San Antonio or Six Flags Fiesta Texas. If you're thinking of having stamped concrete installed, there are many contractors in the San Antonio area to choose from. Look for someone who is registered with the city, has a solid work history and is in good standing with the Better Business Bureau. It is best to get a quote from three contractors and pick the one that you feel offers the best value.